Breastfeeding has far-reaching, lasting effects, affecting the lifelong health of both the mother and her child. The nutritious components of breast milk provide crucial immunological and anti-inflammatory properties that protect the child against acquiring a host of illnesses and diseases, as well as improving maternal health outcomes. Although, breastfeeding rates in the United States have increased over the last few years, they still fall far short of Healthy People objectives 2010. Now, the Healthy People 2020 objectives, including an overall objective of 81 percent of infants ever being breastfed, are consistent with the universal medical recommendation to breastfeed exclusively for six months with continued breastfeeding for at least one year. Breastfeeding is an essential public health strategy to improve infant and child morbidity and mortality rates, improve maternal morbidity, and assist in controlling the cost of health care. Infant formula costs the average family in the United States between $1,200 – $1,500 annually. According to the United States Department of Agriculture, a minimum of $3.6 billion in medical expenses per year would be saved if 50 percent of children were breastfed for the first six months. If 90 percent of children in the United States were exclusively breastfeed for six months, an estimated $13 billion annually could be saved from reduced direct and indirect medical expenses. What are the health benefits of breast milk? The health benefits of breast milk for children are unparalleled. 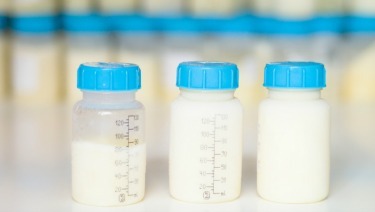 Breast milk not only contains immunological properties that protect a newborn, but research has shown that the overall risk of Sudden Infant Death Syndrome is twice as great for formula-fed infants compared with breastfed infants. The widespread health benefits of breastfeeding extend beyond their child’s first few months of life. Children that are breastfed experience an overall 72 percent reduction in the risk of hospitalization due to lower respiratory tract diseases. There are numerous health benefits, listed on Table 1. Breastfeeding is a wonderful gift for you as well as your baby. This post is in response to the CBS news article titled ” Breast-Fed Children Not Necessarily Smarter Study Finds“. Considering that breast milk is human specific, the capacity to indicate ‘smarter’ is questionably relative and of little substance. Why is so important to cast shadows on breastfeeding, a positive organic source of life? Why purpose written or televised media to cause emotional harm to a new mom who may have little to no support in her well intended choice to naturally breastfeed her child? But as this article suggest, my higher level of education would suggest that there is no real link to the fact that I was a breastfeeding mom. Honestly, it was my connection to a breastfeeding mom who did not have my level of ‘higher level of education’, that became my primary source for understanding the importance of breastfeeding. After the first few months of ‘nursing’ my first son, while attending a pediatric well-baby check up, Mr. Doctor asked if I were still breastfeeding. I responded ‘yes Sir, I am’. He said, “it makes them smarter, you should nurse all your children.” At that time he had been in practice greater than 30 years. Hmmmm, seems like he had put his years of baby / breastfeeding study time into place that would give him the credentials to make a sound statement in favor or against breastfeeding. He was a supporter in favor of nursing (Breastfeeding). I preferred the older more experienced doctors to assist me during my young years of motherhood. My Peds Dr. required his client’s parents to be very attentive and responsible, he did not excuse laissez faire parents. Looking back, I am so glad that I trusted my life experienced trained medical doctor as to many of the benefits of breastfeeding rather than a journal with questionable motives. Just as he was my children’s pediatrician, I have become, Old School. Subscribe to become in the know about Mommy Scrubbs.